Improve outcomes by helping your patients better afford their medications. Use the SlashRx Pricing Tool to identify the best price pharmacy for your patient’s medications. Did you know? 64% of Americans with prescriptions are non-adherent. One of the main reason's patients do not take their medications as prescribed is high cost. With the SlashRx Pharmacy Discount Program, you can help your patients save up to 87% off retail prices on thousands of medications. Our free card is accepted at over 67,000 pharmacies nationwide including all major retail pharmacies and most independents, and everyone is eligible. Do not have insurance or prescription coverage. Have insurance or Medicare, but have high deductibles, non-covered medications, high copayments or plan maximums (caps on their benefits). Do not want to submit medications under their current health insurance. Are in a waiting period for healthcare coverage. Display the stand and prescription savings cards in a prominent location that is easy for your staff to access i.e. Front desk area, patient exam or waiting room. Tell your patient to visit www.slashrx.com and use our Online Pricing Tool to identify the best price pharmacy for their prescription medications. And pay the discounted price, it’s that easy! These free cards are are accepted at over 67,000 pharmacies nationwide and can save your patients up to 87% off their prescriptions. To help you improve patient outcomes and build loyalty, we can custom brand these cards with your logo or practice name completely free of charge. The display stand explains how it works and who can benefit most from the program. 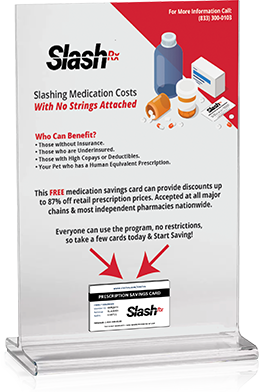 "A health system in New Jersey distributes branded SlashRx medication saving cards to their patients at discharge from the ER. A review of 4,500 pharmacy transactions using the SlashRx card over a two-month period showed a savings to their patients of over $86,000 representing an average savings of $19.37 per script." A free medication savings card for your patients that yields tangible price reductions like this will increase patient adherence levels and build brand loyalty to your practice or system. Would you like your cards custom branded with your facilities logo or name?